Etching allows numerous businesses to meet demand and manufacture quality products ”“ but have you ever thought about how the process could save your life? Numerous sectors use etched components, manufactured to their own specific requirements, in order to meet tight deadlines. One of the main uses for the process is manufacturing instruments for the medical sector, meaning that one day, etching literally could save your life. Small medical instruments used by surgeons for the most delicate operations and procedures are made by the Qualitetch team. 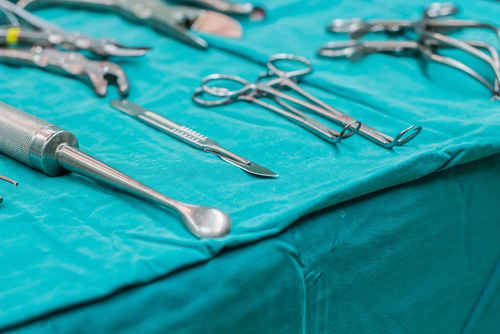 Such instruments include diaphragms, surgical blades and scissors. These instruments must be produced to the highest quality with absolutely no room for error. Through the process, life-saving operations can be performed ”“ even the best surgeon in the world requires state-of-the-art equipment to match. When producing instruments for the medical sector, the standards are understandably high and testing is rigorous. Stress and burr-free instruments are manufactured to within 0.010mm, resulting in a better end product than other methods such as laser cutting. On top of this, etching is a cost effective solution which allows the medical sector to focus on patient care. The process of manufacturing surgical blades such as scalpels does not differ too much from any other product that can be produced via the etching process. Qualitetch takes a systematic approach to ensure the best possible quality. After receiving the design, metal is passed through acid and alkaline solutions for a thorough clean before the process begins. UV photosensitive resist is applied to both sides of the metal and any excess is removed. The design artwork of the blade is applied to the sheet metal using a two-sided photo tool to ensure accuracy, before being exposed to UV light to harden the untouched metal, leaving the design. Ferric Chloride, the main chemical etchant, is then introduced to attack the unprotected metal, producing large numbers of blades in a short amount of time. After the etched parts have passed through a stripping chamber to remove the remaining photoresist, Qualitetch”™s team of technicians carry out a thorough inspection of each manufactured part. All metal etched parts are subject to inspection by state-of-the-art Automated Optical Inspection Equipment CMM, which can complete accurate first article reports. This practice is not only commonplace when producing medical instruments, but it is also followed for all components manufactured via the etching process, ensuring the highest quality is maintained for each and every component. For more information on etching and how your business could utilise the process, please call our team of experts on 01354 658787.